Two new images claiming to be of the HTC One 2 have surfaced, giving us our first clear look at the front of the device and revealing some deviations from the design of the HTC One. 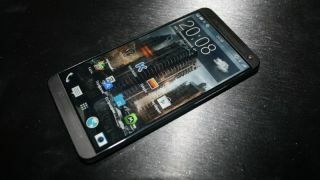 The photos, found by Russian site MobilTelefon.RU, show a phone that looks remarkably similar to the HTC One. It's the same shape and has the same metal speaker grills at the top and bottom. But there are a couple of differences. First up the bezel around the screen looks thinner than the One, giving it an almost edge-to-edge appearance. The other change deals with the navigation buttons, on the HTC One they are below the screen but these new images suggest the HTC One 2 will have them on-screen. The similar overall design and on-screen buttons both tally with previous rumors we've heard, plus moving the buttons on-screen would make sense anyway, as it would allow for a larger, 5-inch display without increasing the overall footprint of the handset too much. So in that sense the photos seem like they could well be genuine and they certainly look convincing enough. But on the other hand it wouldn't take a Photoshop master to make such minor modifications to an HTC One image. Curiously one of the images doesn't feature the navigation buttons at all, which suggests they can be hidden when not in use, even when on the homescreen. That would make sense too, but rather than obscuring the bottom of the phone's wallpaper the images suggest that the wallpaper actually gets resized to accommodate the buttons, which seems somewhat less likely and raises a red flag as to the authenticity of the pictures. Hopefully we should know soon enough whether this is the real face of the HTC One 2, as it's rumored that the flagship phone will be revealed at either MWC or a late March launch event. You've seen the front of the phone, why not check out the back?